Vallentin D, Kosche G, Lipkind D, et coll . Neural circuits. Inhibition protects acquired song segments during vocal learning in zebra finches . Science 2016, 351:267-71. Boucaud ICA, Mariette MM, Villain AS, et coll . Vocal negotiation over parental care? Partners adjust their time spent incubating based on their acoustic communication at the nest . Biological Journal of the Linnean Society 2016, 117:322-36. Kleindorfer S, Evans C, Mahr K. Female in-nest chatter song increases predation . Biology Letters 2016, 12:20150513. Morell V. Why some female birds don’t sing . Science News , 12 janvier 2016. Kleindorfer S, Evans C, Colombelli-Négrel D. Females that experience threat are better teachers . Biology Letters 2014, 10:20140046. 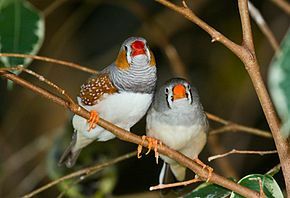 Derégnaucourt S, Gahr M. Horizontal transmission of the father’s song in the zebra finch (Taeniopygia guttata ) . Biology Letters 2013, 39: 20130247. Colombelli-Négrel D, Hauber M, Robertson J, et coll. Embryonic-learning of vocal passwords in superb Fairy-wrens reveals intruder cuckoo nestlings . Current Biology 2012, 22:2155-60. Prather J, Peters S, Nowicki S, et coll . Precise auditory vocal mirroring in neurons for learned vocal communication . Nature 2008, 451:305-10.